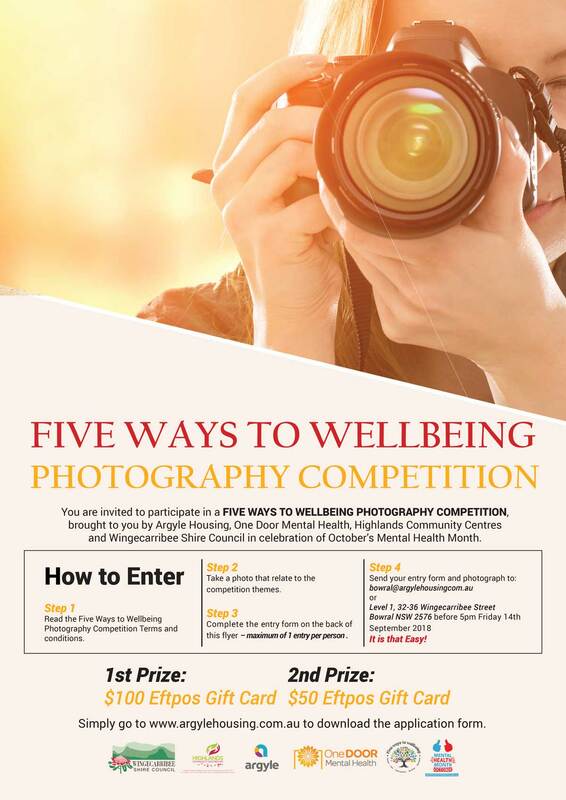 You are invited to participate in a FIVE WAYS TO WELLBEING PHOTOGRAPHY COMPETITION, brought to you by Argyle Housing, One Door Mental Health, Highlands Community Centres and Wingecarribee Shire Council in celebration of October’s Mental Health Month. As life becomes busier, it is important to protect our mental health and wellbeing. The Five Ways to Wellbeing is a set of easy actions that can enhance mental and physical wellbeing. BEING ACTIVE: Physical activity can enrich mental and physical wellbeing and make you feel and look good inside and out. Participate in a physical activity that you enjoy and suits your level of mobility and fitness such as playing a game, gardening, dancing. CONNECTING: Social relationships with family, friends, colleagues and neighbours are critical for promoting wellbeing and for acting as a buffer against mental ill health for people of all ages. Think of these as the foundations of your life and invest time in developing them. Building these connections can support and enrich you every day. GIVING: Do something nice for another person. Thank someone. Be generous to others. Smile at someone. Volunteering is associated with having a sense of purpose and meaningful life. Keep Learning: Try something new. Rediscover an old interest. Set a challenge for yourself. Remain curious. Learning new things will make you more confident as well as being fun. TAKING NOTICE: Observe the beautiful. Remark on the unusual. Notice the changing seasons. Savour the moment, whether you are walking down a street, eating lunch or talking to another. To take notice is to be consciously aware of the world around you and how you are feeling in the moment. Introducing the Five Ways to Wellbeing regularly into your everyday life can positively contribute to overall wellbeing. We would like to see photos taken by the Wingecarribee community that reflect any one of the Five Ways to Wellbeing themes, for example you could capture the surrounding natural flora, enjoying the company of loved ones or friends, showing off a new skill or hobby you are learning, or simply portraying the splendour you see around the Wingecarribee Shire. Download your APPLICATION FORM from HERE and read the Five Ways to Wellbeing Photography Competition Terms and conditions. Take a photo that relate to the competition themes. Complete the entry form on the back of this flyer – maximum of 1 entry per person .